At my son’s school, I helped organize a Zero Waste Lunch Week, which took place Feb. 19–23, 2018. 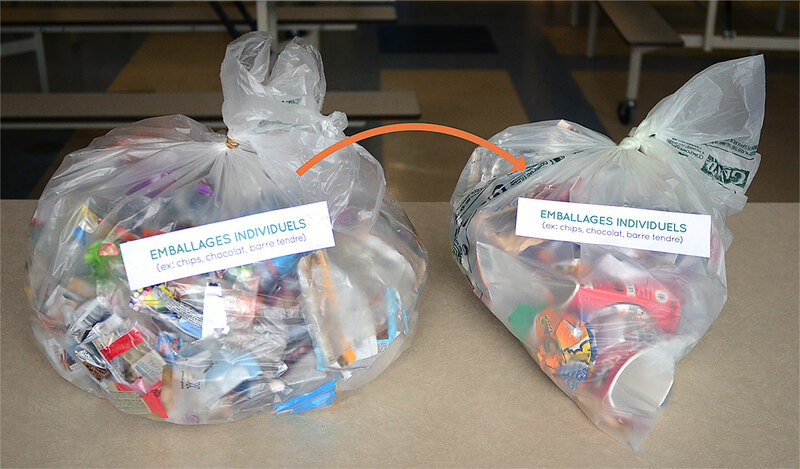 After sorting all the trash produced during one school day again, we discovered that our school reduced its trash by (drum roll please…) 53% during our Semaine Boîte à Lunch Zéro Déchet!!! A whopping 762 zero waste lunches were brought to school, saving 6 1/4 large trash bags (8 kg) from going to the landfill last week. In the photo above, you can see how much we were able to reduce trash in one of our biggest categories: individual snack packaging. The left bag is full of snack wrappers from a typical Thursday; the right bag is from the Thursday during Zero Waste School Lunch Week. Other trash categories saw similar reductions. Thanks to Caroline Boyer for her support and leadership and to all the families who participated. Merci beaucoup! I am reading through your blog and am so inspired by all of this! I have started something where I collect things like bags for chips and am stuffing plastic bottles with them to make plastic bricks to build things. Seems good for this kind of application!